Joseph Jason Putz was born February 22, 1977 in Trenton, Michigan. The tall six foot five right hander, attended the University of Michigan at Ann Arbor going on to pitch in the major leagues with a long line of other Wolverines. In his college days he shared a dorm with New England Patriots Quarterback Tom Brady. Putz was drafted three different times, lastly by the Seattle Mariners in the 6th round of the 1999 draft. In the minors he was mostly a starting pitcher, switching to a reliever in 2003 when he saved 11 games in 41 appearances. Putz debuted in 2003 with a good fastball at around 97 mph. 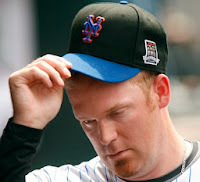 Over the next two years he became a middle reliever behind closer Eddie Guardado, going 6-5 with a 3.60 ERA in 2005. That year Guardado taught him to throw a split finger fast ball & it changed Putz into a much better pitcher. He took over the Mariners closer role in 2006 & saved 36 games (6th in the league) going 4-1 with a 2.30 ERA. The following year he was spectacular, leading the A.L. in appearances (65) going 6-1 with a 1.35 ERA & 40 saves (second in the league). He won the Rolaids Relief Man of the Year Award & set a Mariner record of 30 consecutive saves. 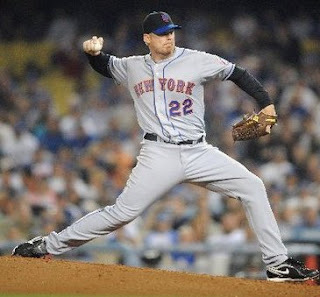 Elbow injuries nagged him throughout the 2008 season & he fell to a 6-5 with 15 saves (3.88 ERA) in 47 appearances. In December of 2008 Putz came to the New York Mets along with Sean Green & Jeremy Reed in a three team trade also involving the Cleveland Indians. 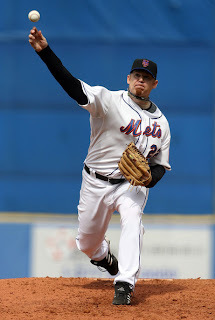 The Mets sent away fan favorite Endy Chavez, along with Joe Smith, Aaron Heillman & Jason Vargas in the trade. There was a lot of excitement for 2009 at the new Citi Field with Putz expected to rebound from his injury, accepting a set up role behind new Mets closer Frankie Rodriguez. Putz pitched for Team USA in the 2009 World Baseball Classic. Putz appeared in the first two games of the season, getting credited with two holds in the Mets first two wins in Cincinnati against the Reds. 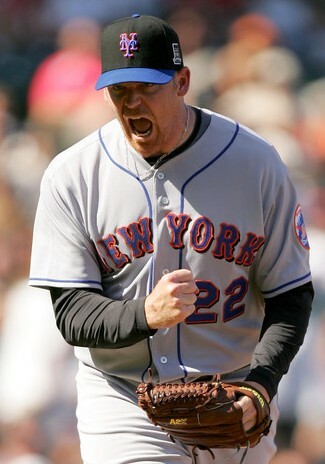 On April 17th he earned his first win it came against the Milwaukee Brewers at Citi Field. On April 21st he came into a tie game (4-4) at Citi Field against the St. Louis Cardinals, he gave up an RBI double & sac fly RBI taking the loss. A week later he blew an 8th inning save when Florida's Cody Ross drove in two runs giving the Marlins the lead & the eventual win. Putz had a decent May with two saves & six holds, allowing seven earned runs over 17 innings. His ERA was at 3.81 at the end of May before he suffered more elbow problems. In his last three outings he allowed seven runs in 1.1 innings over three games before getting shut down for the rest of the season. On June 1st the Pirates got him for three runs in less than inning of work & then on June 4th they got him for two more runs over one inning in Pittsburgh. His ERA ballooned to 5.22 as he finished the year at 1-4 with two saves allowing 18 runs in 29 innings. The Mets chose not to pick up his option in 2010. He went to the Chicago White Sox & served as set up man to Bobby Jenks going 7-5 with a 2.83 ERA. He recorded 14 holds & three saves while making 60 appearances. 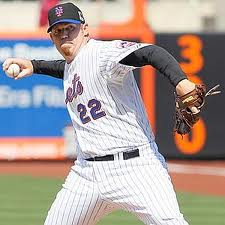 In December 2010 he signed with the Arizona D-Backs & was penciled in as their closer for 2011. He recorded 45 saves (third most in the NL) for the 2011 NL Western Champion D-backs, posting a 2.17 ERA going 2-2 in 60 appearances finishing 52 games (7th in the NL). He followed up 2012 with 32 saves & a 1-5 record posting a 2.82 ERA. In 2013 the D-backs closer role went to Heath Bell (15 saves) & Brad Ziegler (13 saves). Putz made 40 appearances, with six holds & a 2.36 ERA in 34 innings. He would pitch in just 14 games in 2014 before ending his big league career. Putz & his family resided in the Pelham Manor section of New York during his time in New York. He now lives in Peoria, Arizona in a residence he kept ever since pitching in the Cactus League. Trivia: He enters the game to the tune of AC/DC's "Thunderstruck". In his twelve year career he made 572 appearances, going 37-33 with 189 saves posting a 3.98 ERA. In 566 innings he struck out 599 batters & walked 184.